DCL HomeWorks has only one mission: to make Deep Creek Lake a second home paradise for home owners. The lake area has been a reprieve from stressful city life for generations and here at HomeWorks, we want to ensure you maximize every minute of your time at the lake. We want to make DCL more than just a part-time home or vacation destination but a place that truly holds a special place in your heart. Over the past 14 years, we have compiled a network of licensed, insured and experienced contractors to manage, fix and renovate any issue a lake home can present. As your single point of contact for any property/home related concern, we want to make sure that caring for or expanding your DCL home is painless, fun and unforgettable. When you reach Sidling Hill (coming from DC or Baltimore) or turn onto 1-79 (coming from Pittsburgh) your mind should slip into a state of relaxation, improved by the certainty of knowing your home has been professionally cared for. If you’re ready to make Deep Creek Lake more than just a getaway, contact DCL HomeWorks today. Deep Creek Lake is Maryland’s largest inland body of water. Like all Maryland lakes, it is man made. Composed of 3,900 acres of water and 69 miles of shoreline, the lake is the perfect retreat for boating, water skiing and swimming. In the summer months the lake’s water temperature reaches the mid-seventies and a variety of native freshwater fish make it perfect for anglers. During the winter months the lake freezes solid offering ice fishermen an exciting getaway. The ancient sport of ice-boating is still practiced on the lake, with both winter and summer adventure sports being popular. The surrounding area offers a variety of state parks. 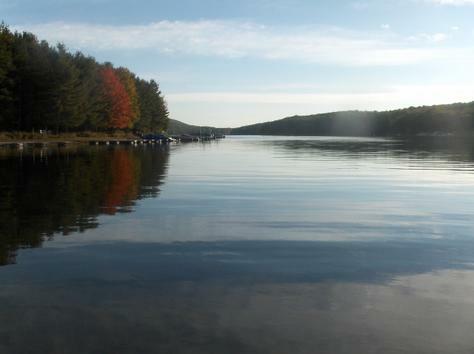 Deep Creek Lake state park offers hiking, swimming, mountain biking and breath taking views. Swallow Falls State Park boasts Maryland’s largest waterfall. Herrington Manor state park, Big Run state forest and New Germany state park are all a stone’s throw away from the lake area. Wisp Resort is located in McHenry, Maryland offering skiing in the winter along with a variety of summer activities. ASCI (Adventure Sports Center International) is nearby and serves as one of the world’s only artificial white water rivers.